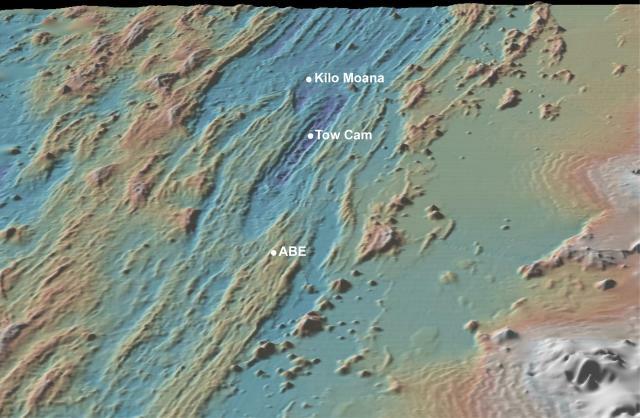 Shaded relief bathymetry of the Eastern Lau Spreading Center (ELSC) with the locations of the Kilo Moana (-2620 m depth), Tow Cam (-2700 m) and ABE (-2140 m) vent fields indicated with white dots. Dramatic changes in the morphology of the ELSC are evident in this image as the spreading center transitions from a flat deep axial valley, to a well-defined axial valley, to a axial ridge. View is to the north, and vertical exaggeration is 2x. Image made using GeoMapApp.